The basic building block of Amazon RDS is the DB instance. This is the environment in which you run your Oracle databases. For an example that walks you through the process of creating and connecting to a sample DB instance, see Creating an Oracle DB Instance and Connecting to a Database on an Oracle DB Instance. The Oracle editions that are available vary by AWS Region. In the Select engine window, choose the Select button for the Oracle DB engine you want to use and then choose Next. On the Specify DB details page, specify your DB instance information. For information about each setting, see Settings for Oracle DB Instances. On the Configure advanced settings page, provide additional information that RDS needs to launch the DB instance. For information about each setting, see Settings for Oracle DB Instances. To create an Oracle DB instance by using the AWS CLI, call the create-db-instance command with the parameters below. For information about each setting, see Settings for Oracle DB Instances. The following command will launch the example DB instance. To create an Oracle DB instance by using the Amazon RDS API, call the CreateDBInstance action with the parameters below. For information about each setting, see Settings for Oracle DB Instances. 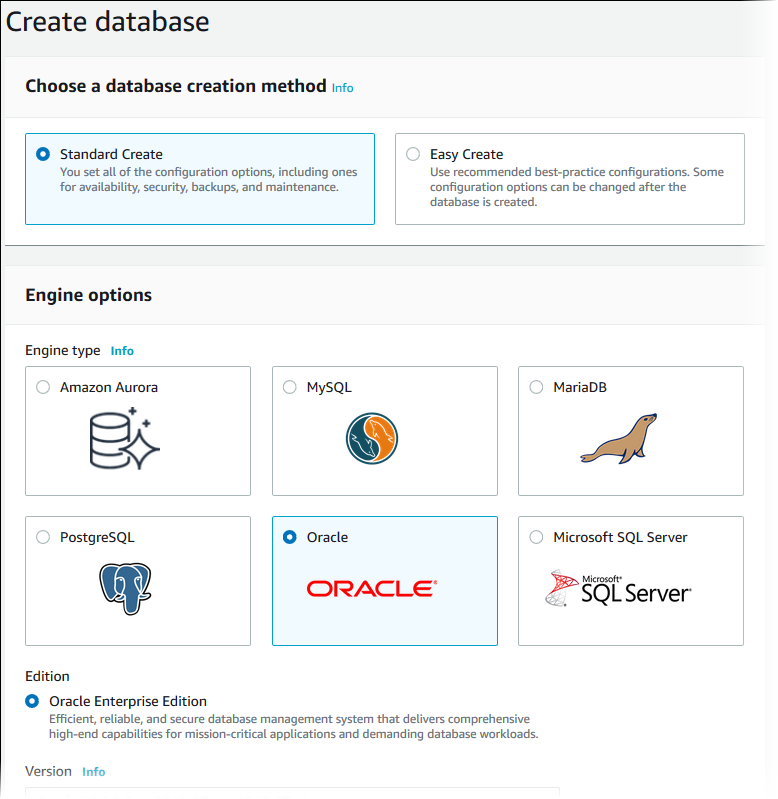 The following table contains details about settings that you choose when you create an Oracle DB instance. The amount of storage to allocate your DB instance (in gigabytes). In some cases, allocating a higher amount of storage for your DB instance than the size of your database can improve I/O performance. Some options, such as Oracle Locator, Oracle Multimedia, and Oracle Spatial, require that you enable automatic minor version upgrades. Upgrades for DB instances that use these options are installed during your scheduled maintenance window, and an outage occurs during the upgrade. You can't disable automatic minor version upgrades at the same time as you modify the option group to remove such an option. The availability zone for your DB instance. Use the default of No Preference unless you need to specify a particular Availability Zone. The number of days that you want automatic backups of your DB instance to be retained. For any non-trivial instance, you should set this value to 1 or greater. The character set for your DB instance. The default value of AL32UTF8 is for the Unicode 5.0 UTF-8 Universal character set. You cannot change the character set after the DB instance is created. For more information, see Oracle Character Sets Supported in Amazon RDS. The name for the database on your DB instance. The name must begin with a letter and contain up to 8 alpha-numeric characters. You can't specify the string NULL, or any other reserved word, for the database name. If you do not provide a name, Amazon RDS does not create a database on the DB instance you are creating. The port that you want to access the DB instance through. Oracle installations default to port 1521. The version of Oracle that you want to use. For more information, see Choosing the DB Instance Class and DB Instance Class Support for Oracle. The name for your DB instance. The name must be unique for your account and AWS Region. You can add some intelligence to the name, such as including the AWS Region and DB engine you chose, for example oracle-instance1. For more information, see Working with DB Parameter Groups and Modifying Oracle sqlnet.ora Parameters. The license model that you want to use. Choose license-included to use the general license agreement for Oracle. Choose bring-your-own-license to use your existing Oracle license. For more information, see Oracle Licensing. The name that you use as the master user name to log on to your DB instance with all database privileges. This user account is used to log into the DB instance and is granted DBA privileges. For more information, see Oracle Security. The password for your master user account. The password must contain from 8 to 30 printable ASCII characters (excluding /,", and @). Create replica in different zone to create a standby replica of your DB instance in another availability zone for failover support. We recommend Multi-AZ for production workloads to maintain high availability. For development and testing, you can choose No. This setting depends on the platform you are on. If you are a new customer to AWS, choose the default VPC. If you are creating a DB instance on the previous E2-Classic platform, choose Not in VPC.